The Quinnipiac Bobcats (0-3-0, 0-0-0 Eastern College Athletic Conference) lost in overtime to the Maine Black Bears (1-0-0, 0-0-0 Hockey East Association) on Friday by a score of 3-2. 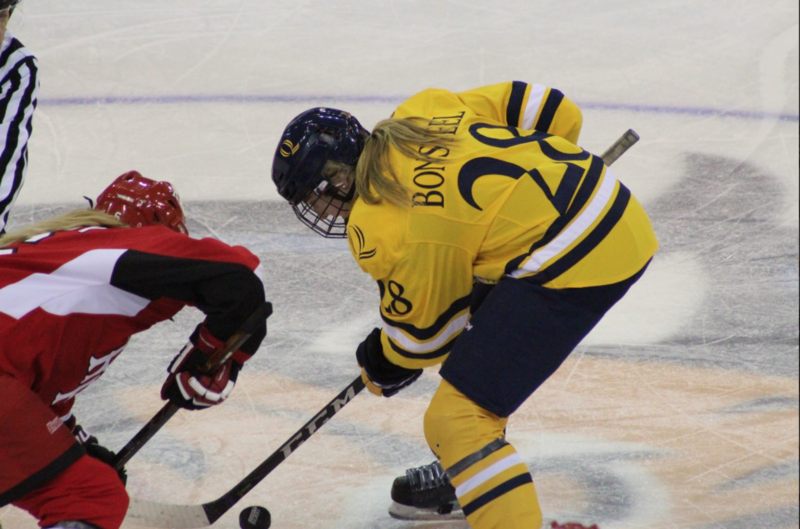 The Bobcats were coming off two straight losses to the Ohio State Buckeyes last weekend, both by a score of 3-2. The Bobcats going in were looking to get something going and get their first win of the season against the Maine Black Bears at home. The Black Bears came in looking for their first win of the season, as well, after winning their only exhibition game against University of New Brunswick. The game started out very fast paced in the first period of the game. Both teams moved the puck very well, but neither could find the back of the net. After two shots by the Black Bears, the Bobcats had their first shot on goal. A few minutes afterwards, sophomore forward Grace Markey put some nifty moves on two Black Bear defenders but could not finish at the net. On the other end, junior goaltender Abbie Ives was saving and blocking many shots on from the Black Bears. Celine Tedenby of the Black Bears had the first penalty of the game, but the Bobcats failed to capitalize on the power play. Both teams came out defensive minded however and focused, even with the fast pace of play. At the end of the first period, shots were seven to the Black Bears and five to the Bobcats. The second period is where the scoring started to happen. Less than a minute into the second period, Lexi Adzija, freshman forward, scored her first collegiate goal to get the Bobcats a 1-0 lead. However, Randi Macon, senior forward, went to the penalty box to put Maine on the power play, but the Bobcats penalty kill proved stronger. Maine took control of the puck rest of the period, ended up with nine more shots on goal. However, Ives held her ground until the final five minutes of the period. This time, junior defenseman Kati Tabin got the penalty for the Bobcats with five minutes to play. Maine found the top right corner of the net with Tereza Vanisova scoring her first goal of the game and having a successful powerplay as the Black Bears tied the game 1-1. Both teams played even for the most of the period, both teams grabbed momentum at points but Maine had the momentum at the end of the period. The third period showed just how much momentum the Maine Black Bears had. The beginning of the period was very slow pace of play with both teams not wanting the opponent to have great breakaway chances and playing more defense. However, once pace of play went up, Maine showed how much more energy they had than Quinnipiac. Maine had 12 more shots in the third period to Quinnipiac’s one. Maine was able to get way more shots than the Bobcats and out run them, but Ives held strong through the whole period and not allowing one goal. The Bobcat’s Adzjia did pick up a penalty near the end of the period, but the Black Bears could not respond in their power play. As a result, the game went to overtime tied 1-1. Into overtime, the Bobcats got into a power play right away. Liga Miljone had a penalty a 21 seconds into overtime. In that power play, the Bobcats were able to get two shots on goal, but both failed to go in. However, after the power play, on the only shot the Maine Black Bears had in overtime, Tereza Vanisova scored her second goal of the game to win the game for Maine by a score of 2-1. Even after the loss, Coach Cassandra Turner had some positive takeaways from the game. “We had a ton of saves, we made some tremendous plays and moved the puck quickly…It’s a good game from us, we have a lot to learn and we get another opportunity to play them tomorrow”. The Bobcats get right back into playing the next day Saturday, 3 p.m. at People’s United Center, against the Maine Black Bears (1-0-0,0-0-0 Hockey East Association) again. The Bobcats will look to get their first season win and the Black Bears will look to get their second win of the season.